The Ekiti State Government has said it has no intention to proscribe commercial motorcycle operation popularly known as Okada riders in the State. The Deputy Governor, Otunba Bisi Egbeyemi explained that the intention of the state government was to promote peace and unity among transport associations. Egbeyemi, who disclosed this while receiving in audience the state executives of Okada Riders Association in his office, Ado Ekiti, assured that government will create any enabling environment needed for the flourish of their business. A statement on Wednesday signed by the Special Assistant (Media) to the Deputy Governor, Odunayo Ogunmola, quoted Egbeyemi as warning Okada riders against being used to perpetrate crime in the state. According to him, government would not tolerate any act of indiscipline or lawlessness among transport associations. The deputy governor observed that some of their (Okada riders) members have been accused of engaging in unholy acts like bag snatching, pick pocketing, waylaying on banks customers after withdrawing money from the bank and other nefarious acts. Egbeyemi encouraged the leadership of the association to device measures of addressing the problems in the interest of peace. He said: â€œWe want peace to reign in your association, we donâ€™t want factions among you. We want you to be under one umbrella, to allow the government to stand by you. â€œI pray that God will give your association the ability to maintain peace and to achieve success. We need your support and government will also support you. â€œOnce you are united you become formidable for anyone to destabilize your association. â€œAgainst the rumour that we will bar you if we get elected into office, have we barred your association since we assumed office? 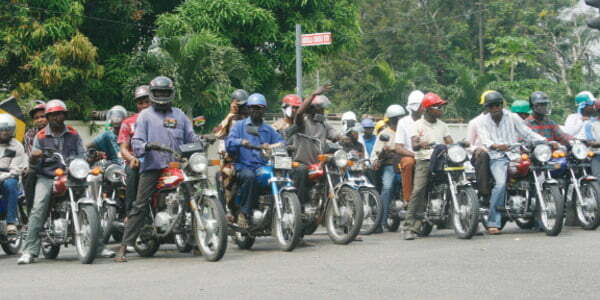 Our government had no intention of barring Okada riders from working in the State. All we want is peace. â€œYou have to checkmate those that are fond of engaging in criminal activities across the State under the guise of being Okada riders. Earlier, the State Chairman of the Association, Mr Kunle Asaolu and the Chairman Board of Trustee of the Association in the State, Chief Akorede Adegboyega, pledged the support of commercial bike riders to the success of the Fayemi administration. administration and promised to maintain peace in the State. Adegboyega demanded that the modality adopted by the association in generating internal revenue for the government should be allowed to remain. He expressed concern that some individuals are portraying themselves as government representatives in the interest of causing a divide-and-rule among the association. Too bad. Crime will increase now.